School districts across the country are increasingly seeking out digital tools to support the work of educators, in the hopes of improving students' academic achievement. With the rapid emergence of this new market, many districts have been challenged by the task of identifying and procuring educational technology (ed-tech) products that match the needs of their educators and students. 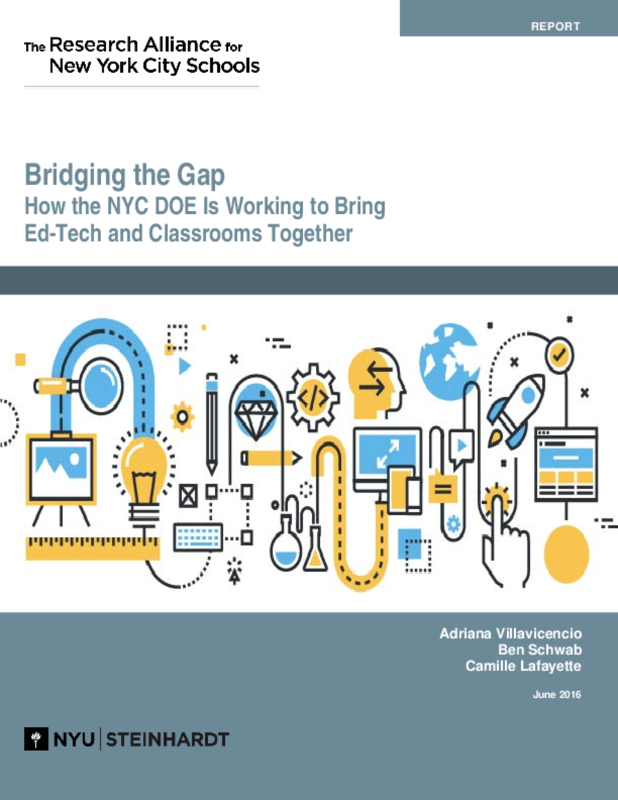 The NYC Department of Education's "Innovate NYC Schools" division, supported by a U.S. DOE Investing in Innovation (i3) grant, aims to address this problem, in part by promoting "user-centered design," an approach that puts the needs and preferences of products' intended users (in this case, teachers, students, and parents) front and center in the development and procurement of new technology. School Choice Design Challenge (SCDC),an effort to develop apps that would help students explore and narrow down their choices of high school. #SharkTankEDU events, during which ed-tech developers present a product to a panel of educators who provide feedback on the tool. Short-Cycle Evaluation Challenges (SCEC), a classroom-based, semester-long pilot of ed-tech tools intended to inform product development, as well as the ultimate procurement decisions of school staff. The report focuses on four phases of work involved in bringing ed-tech companies and the users of their products together: defining a problem; selecting users and ed-tech companies; implementing pilot-based initiatives; and evaluating products. It describes strategies used and challenges faced, and offers practical lessons gleaned from the experiences of the individuals who designed and participated in these efforts.